Scientists have discovered the world's longest known chain of continental volcanoes, running 2,000 kilometres across Australia, from the Whitsundays in North Queensland to near Melbourne in central Victoria. 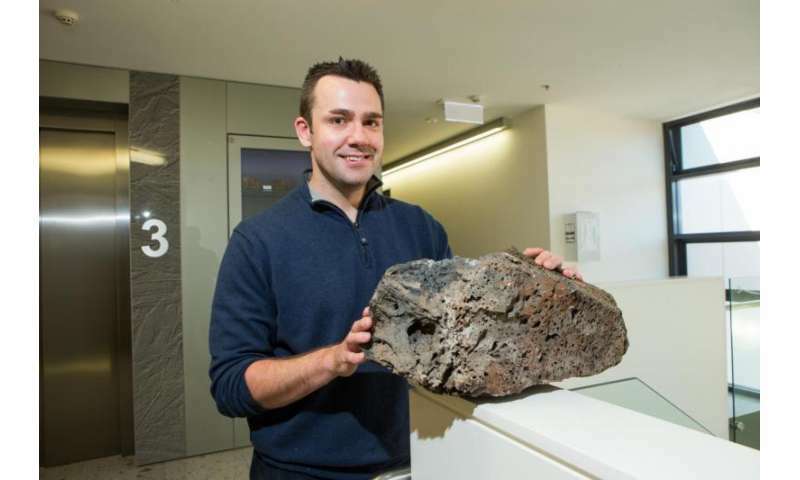 The volcanic chain was created over the past 33 million years, as Australia moved northwards over a hotspot in the Earth's mantle, said leader of the research Dr Rhodri Davies from The Australian National University (ANU). "We realised that the same hotspot had caused volcanoes in the Whitsundays and the central Victoria region, and also some rare features in New South Wales, roughly halfway between them," said Dr Davies, from the ANU Research School of Earth Sciences. "The track is nearly three times the length of the famous Yellowstone hotspot track on the North American continent," said Dr Davies. This kind of volcanic activity is surprising because it occurs away from tectonic plate boundaries, where most volcanoes are found. These hotspots are thought to form above mantle plumes, narrow upwellings of hot rock that originate at Earth's core-mantle boundary almost 3,000 kilometres below the surface. The study, published in Nature, found that sections of the track have no volcanic activity because the Australian continent is too thick to allow the hot rock in mantle plumes to rise close enough to the Earth's surface for it to melt and form magma. The research found that the plume created volcanic activity only where Earth's solid outer layer, called the lithosphere, is thinner than 130 kilometres. These new findings will help scientists to understand volcanism on other continents and from earlier periods in Earth's history, said co-author Dr Nick Rawlinson, now at the University of Aberdeen's School of Geosciences. "Ultimately this new understanding may help us to reconstruct the past movements of continents from other hotspots," he said. The giveaway that the continent is just thin enough for melting to begin, such as in northern New South Wales, is the formation of an unusual mineral called leucitite. Leucitite is found in low-volume magmas that are rich in elements such as potassium, uranium and thorium, said co-author Professor Ian Campbell from the ANU Research School of Earth Sciences. "Now that we know there is a direct relationship between the volume and chemical composition of magma and the thickness of the continent, we can go back and interpret the geological record better," Professor Campbell said. 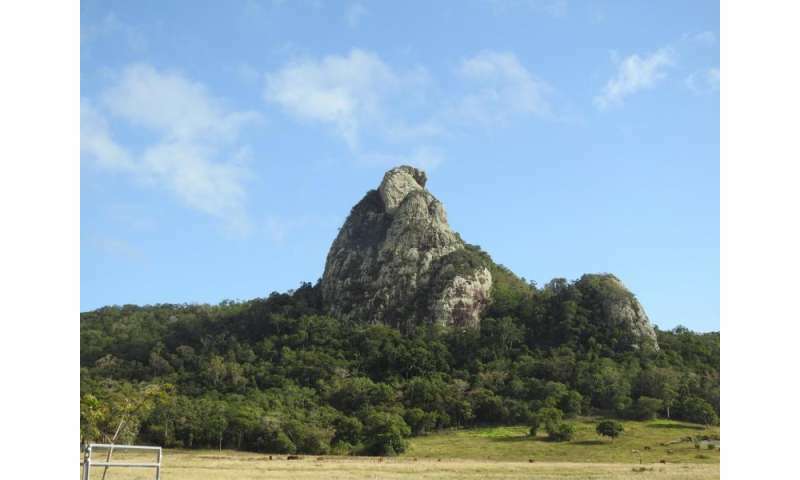 The scientists have named the volcanic chain the Cosgrove hotspot track. Dr Davies said the mantle plume that formed the Australian volcanoes is probably still in existence, under the sea a little to the northwest of Tasmania. "There are observations of higher mantle temperatures and increased seismicity in this region," he said. Is old rock really as 'solid as a rock'? Hmm....If Australia was spun off from Africa as newgeology.us suggests, then there would be evidence of the hot spot existing before Australia was over the hot spot? There is a parallel hot spot chain of mountains on the eastern coastline of Australia. It started on land from around the scenic rim in Brisbane and moved down the Great Dividing Range, and now the 'hot spot' lies in Bass Strait, between Victoria and Tasmania.